Why did Elimelech and his family move to Moab? (There was a famine.) Elimelech, as a Jew, should have stayed in Israel where God had placed His people. Moab was an idol-worshipping enemy of God’s people. However, Elimelech acts in haste and moves to Moab. It will be his undoing. Who are Orpah and Ruth? (The Moabite wives of Mahlon and Chilion) So Naomi is left without any male relatives to care for her and her daughters are from the heathen country of Moab. What news about Israel does Naomi hear of and what does she decide to do? (The Lord answered Israel’s prayers and the famine is over. She decides to return home on foot.) She starts out with her daughters-in-law, but then thinks better of it. She tells them to back as she will not be able to provide new husbands for them. Ruth 2 – When Naomi and Ruth arrive in Bethlehem, it is the barley harvest. They are very poor, but Israel had laws of provision for the poor (Lev. 19:9-10, Deut 24:19). Naomi sends Ruth out to get grain for them so they can eat. How does Boaz react the presence of Ruth and what does he find out about her? (She catches his eye and he finds out how she a Moabite and is taking care of Naomi. He is impressed with her hard work and her love for Naomi.) 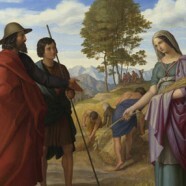 Boaz instructs his men to protect Ruth and give her special consideration. She is given lunch with the harvesters and ends up with about 30 lbs. of grain, much more than what a poor person would usually get. When Ruth gets home, Naomi realizes that someone is taking care of Ruth. What does she say about Boaz? (He is kind and that he is one their kinsman redeemers.) Read Leviticus 25:25 and Deut. 25:5-10. What is the job of the kinsman-redeemer? (to sell his own property and give the money to his poor relatives to provide for them; he had to be a relative, have money himself and be willing to redeem) Naomi tells Ruth to continue going to Boaz’s fields until harvest is over. What does Naomi tell Ruth to do next? (Wash, put on her best clothes and go to the threshing floor that night where Boaz would be. She was to uncover his feet and then lie down there at his feet.) This was not a weird thing to the people of that time as it is to us! By doing so, Ruth was telling Boaz she wanted him to be the kinsman redeemer for Naomi and herself. She new that this meant marrying him. What is the reaction of Boaz to this? (He was willing to be the kinsman redeemer. There was a problem, though. One man was a closer relative than he was.) Boaz commends Ruth, first because she stuck with Naomi in the first place and then because she was willing to marry him, an older man, rather than chase after younger men. Ruth 4 – The courthouse of that day was always found at the town gate. So Boaz hurries there to find the closer relative. As he enters, Boaz approaches and tells him to sit down and the 10 of the town elders are gathered to judge the case. How does the man respond to the problem of Naomi and Ruth and why? (He decides to buy the property of Elimelech back until he realizes that marriage to Ruth is required. This means that any children Ruth has will get the land, not he. He refuses because to do so will harm his own estate.) The man gives Boaz the go-ahead to do it himself. Boaz joyfully goes to Ruth and marries her. Soon after a son is born, whom they name Obed. Naomi’s friends gather around and praise the Lord who has blessed her with a “son” and a wonderful daughter-in-law, who has better to her “than seven sons.” Now comes the “End of the Story”: Obed is the father is Jesse who is the father of David. Ruth becomes the great-grandmother of David. This book establishes the line of David, the ancestor of Christ Not only that, but guess who Boaz is? The son of Rahab (Mt. 1:5). Thus, we learn how two women who were not Jews come to be in the lineage of the King of Kings, Jesus! Do a contrast & comparison on the lives of Delilah, Ruth and Hannah. How are they alike? How do they differ? What strengths and weaknesses did they have? What can one learn from them and their example? Which one of them speaks to you and your life the most and why? Ruth was a great example of how to relate to your family members. List the things she did and the attitudes she portrayed towards Naomi and her future husband, Boaz. What kind of person was Ruth? How did God use her? What kindnesses have you shown to relatives who love you and depend on you? How can you specifically be more like Ruth in your family relationships?